Catalunya is steeped in culture with its traditions and festivals dating back over thousands of years. Rich in mediaeval villages, highlights of this region include prosperous Peratallada, peach coloured Pals and fashionable Begur. The rocky coastline is dotted with pretty fishing villages, crystal clear waters and beautiful beaches, which are all perfect to explore. This holiday provides spectacular, yet relaxed walking and is perfect for people wanting to fit as much as possible into a short holiday. The route takes in the winding, sandy paths of mainland Spain's loveliest coast experiencing frequent glimpses of dazzling aquamarine seas through the umbrella pines, as well as heading inland to discover the truly unspoilt landscape of the Catalan countryside. This is a wonderful region for bird and plant life. Over a third of the countryside is now protected under a government scheme to preserve natural habitats, which means a staggering variety of rare species: golden orioles, booted eagles, purple-shot copper butterflies and colourful wild flowers. Hidden deep in the forests are stunning natural curiosities, including the 5,000-year-old dolmens and sparkling freshwater springs which drew the first settlers to these parts thousands of years ago. 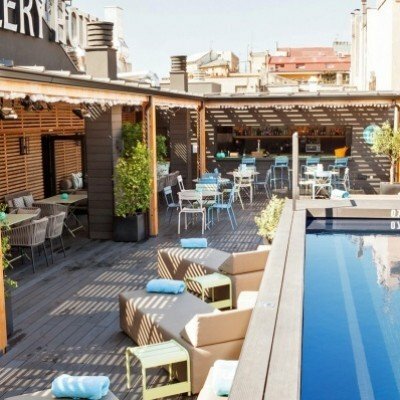 Our hand-picked hotels include the lovely, family run Hotel Garbi in the traditional fishing village of Calella de Palafrugell which is set on the hillside overlooking the sea. The magnificently restored C14 castle, Castell d'Emporda is perched on a rocky outcrop which affords breathtaking views from its terrace and the Hotel Rosa in Begur is renowned for its food and is only 3km from the sea. The walking is fairly gentle on well maintained paths and tracks. Arrive at your hotel where all Headwater guests are accommodated in rooms with private balcony and sea view. It's just a 5 minute walk to the centre of town where you have so many restaurants to choose from that we've left evening meals here up to you. You start with a 20-minute ride to Mont-Ras from where you have a choice of routes. Both routes take you into the Gavarres hills to visit three dolmens with fantastic views as far as Begur and the Illes Medes, before descending to the peaceful mediaeval villages of Fonteta and Vulpellac. 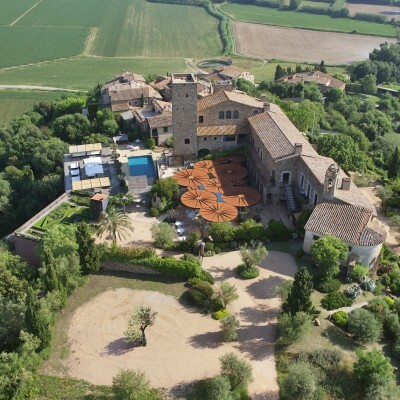 Then it's on to the Hotel Castell d'Emporda which has expansive views across the plain from the terrace by the pool. Laze by the pool or follow our suggested circular walk linking the pretty mediaeval villages of Corca, Monells with a pretty square and lovely choices for lunch, and La Bisbal, a lively market town famous for antiques and pottery. Take time to explore the old quarter including the Carrer de Call, formerly a Jewish ghetto; its intricate arches are still intact today. Alternatively, the local bus goes to Girona and Figueres if you fancy a longer day out. Gentle walking across the Emporda plain, stopping first at Peratallada, possibly the best preserved mediaeval village in Spain with its beautifully restored arches, arcaded passageways and lovely shaded squares. Continue through fields bright with sunflowers until you reach peach-coloured Pals, a lovely old village with Romanesque church affording stunning views. The final stretch takes you through pine forest to our family-run hotel in the old town of Begur. The food here is fantastic! Begur is a fashionable hilltop town with C11 castle, impressive villas and pretty, narrow streets made for exploring! it's just 10 minutes by local bus (mid Jun to mid Sep only) or taxi to the coast, where four beautiful sandy coves await: Sa Riera, Aiguafreda, Sa Tuna and, just over the hill, Aiguablava. For people looking for something a touch more challenging, we provide details of a circular coastal walk which takes in all our favourite places. Shaded forest paths take you to the lively seaside town of Tamariu, with a fantastic beach, where you pick up the pretty coastal path, passing rocky headlands and chic Spanish resorts en route to Llafranc, with spectacular views from the San Sebastian lighthouse. Enjoy lunch in one of the beachfront bars here, where you can almost dip your toes in the water as you eat! Then it's back to Calella, perhaps continuing along the coastal path as far as the botanical gardens at Cap Roig, in time for a swim in the pool or a couple of hours on the beach before dinner. 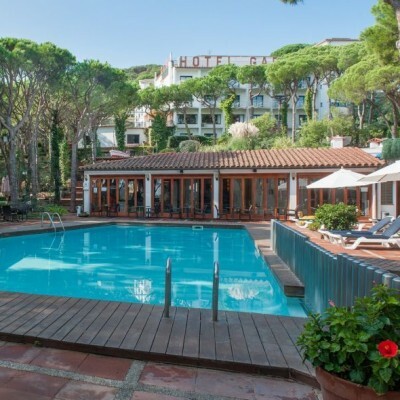 The Hotel Rosa is a pleasant family run *** hotel located in the heart of Begur, a hilltop town. It has been run by the same family for more than 30 years. 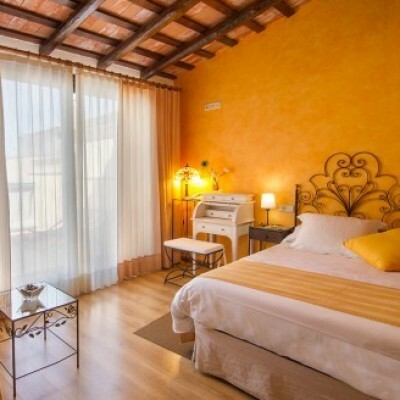 The 21 rooms have a modern and stylish design, all with air-conditioning, satellite TV and telephone. In the bathroom you will find a hydro massage bath tub - perfect for relaxing those aching muscles after a day's walking. Transfers included from Girona train station at 16:18 (16:58 on Saturdays), and back to Girona train station at 11:45. Having undertaken guided walking holidays we wanted to try a self-guided trip which would enable us to set off, stop and finish when we wanted (later start, more and longer stops) and this was perfect. We did three days walking with a day of rest between each walk (altho' ample instructions for further walks were provided). Our luggage was transported seamlessly from one hotel to the next and the hotels were first class both in situation and service (the food was excellent). In addition we tacked several days onto our trip to make a short city break and all arrangements for travel and accommodation were dealt with seemingly effortlessly providing us with a superb holiday experience. Great walking in a lovely area. Accommodation excellent; allowing us to relax in comfort after a long day's walking. The Headwater team are excellent; everything (all booking arrangements, support from local guide) ran perfectly smoothly. Another enjoyable holiday and we are keen to do more. For the money, the holiday could have been longer. 3 hotels of which only 2 provided evening meals. In previous years we have had 4 hotels and an additional days walking. Route notes very good and local information. Our holiday was good fun, route notes were excellent (we didn't need the area maps at all) and the food and wine in Catalan was fantastic and affordable. Our rep Greg was helpful, practical and caring. One of our group couldn't do the walking due to a hip injury and Greg went out of his way to ensure she was able to get from A to B on our hotel to hotel walking holiday. The hotel staff were super helpful and couldn't do enough. This is our fourth trip with Headwater and we'll be looking again for next year. We really enjoyed our trip to northern Spain. All travel arrangements worked well and we were very impressed by Greg, our rep, who met us at the station and couldn't have been more helpful or welcoming. All our hotels were clean and comfortable but the Castell d'Emporda stood out. Beautifully situated on a hill overlooking a patchwork of fields, it's a modern hotel (our room had one glass picture wall with wonderful views) situated in an old castle. The restaurant is relaxed and breezy and the breakfast buffet was truly awe-inspiring. All the walks worked well, although we would have appreciated a bit more shade on the hottest days! We're looking forward to our next Headwater adventure! Very good, well signposted walking routes in a beautiful area of Spain. Perfect for a relaxed walking holiday. Routes took us through lovely and contrasting scenery in a part of Spain that we would probably never have thought to visit. So glad to have discovered it. Very nice and interesting to discover this part of Spain - nature, history, quiet beaches. A magnificent holiday, well organised and all Headwater staff were extremely helpful. The hotels were very comfortable and the food (my God the food!) was astonishingly good. A holiday where we ate as much as we liked and still lost weight! Even though our holiday was rated as easy the walks are challenging and we very very glad of our equipment and a walking pole each although my wife was not keen on the way I whirled around near her head at times. The trees, flowers and bird life were at their very best in May. Nightingales, Cuckoos, Cirl Buntings, Bee Eaters, Hoopoes, Serins, Crested Larks... bring your binoculars. If I were to be picky then on the day 2 walk to La Bisbal we took the longer route (our default decision) which added an extra mile or two through similar countrisde and could have been omitted giving longer at the very pretty last 2-3 miles through villages and farmland. The circular walk (a) on day 3 was lovely, Monells a good place for a coffee and very cheap (coffee, tea and ham baguette for under €5). Day four's walk was great to Pals, villages en route very attractive. We then trekked up the rock path to the observation point at Quermany Gros which turned out to be rather lower in elevation than the castle at Begur and possibly my wife would have said ' I hate you' a bit less often if we'd taken the low road. The kilometre climb up soft sand dunes after this meant we crawled into Begur slightly delerious. Fortunately the Hotel Rosa, though not as luxurious as the others has the most superb restaurant, the owner is the chef. We ate enough to compared with that Vicar of Dibley episode in which Geraldine has to eat 3 Christmas Dinners. Day five's walk was lovely. Day six we actually got lost twice (our fault) due to failure to follow instructions which were uniformly excellent. From Sa Tuna we rebelled and followed the coast path GR92 but I'm not convinced it was 'better'. Our only slight grumble was that we would have missed the train connection from Barcelona Sants to Flaca even if our Ryan Air flight hadn't been delayed by 20 minutes. We sprinted through immigration and got the train from T2 but they only run every 30 minutes and we missed our connection by 15 minutes. The station ticket office man couldn't have been more helpful but intransigently refused to honour our pre-booked ticket meaning we had to fork out an extra €19 for 2 singles. Can we claim this back? Thank you for taking the time to provide your wonderful review of this holiday. It sounds like you had such an enjoyable holiday that you will treasure for years to come. We were however sorry to read that you missed your train due to tight connection times. I will be in touch to refund this amount. We are sorry for any inconvenience this may have caused at the start of your holiday, however are delighted it did not affect your holiday overall. We would like to thank you for travelling with headwater this summer and look forward to welcoming you on another of our holidays in the future. The walking tour was a great way to really explore the countryside. It was comforting to know there was someone there if we got terribly lost or hurt. The notes were very detailed,accurate and all the paths well-marked locally; that made for a very relaxing walking experience. The hotels, whether grand or more humble, exceded our expectations; The Castell d'Emporda was a stunning place to spend our rest day, the food and friendliness at Hotel Rosa was great. Excellent holiday with varied scenery. The 1+ rating is about right. The walks are too long for a 1, but the terrain is not difficult.The timing of the arrival of the plane into Barcelona gave insufficient time to make the scheduled train so we had to wait an hour for the next one. A beautiful area of Spain particularly the coastline with some wonderful accessible walks . Longer walks can be challenging on the warmer days ! A very well considered walking route with accurate and detailed route notes which helped to make the holiday very enjoyable. We opted to stay an extra night in one of the suggested hotels which worked out very well. We liked the independence and choice of pace the holiday presented even though we had the full back up of Headwater representatives there if we had needed them. The rating of 1 boot + for the Catalan Classic tour was appropriate as was the 'at a glance' write up in the brochure. Overall this walk/holiday fulfilled our expectations and introduced us to a lovely part of Spain. An excellent walking holiday with a well chosen itinerary and beautiful scenery. Standards of food and accommodation were very high. We all had a great time. Outstanding food in lovely hotels. Top class local support, advice and guidance. Stunning walks through fascinating medieval villages, shady forests and patchwork quilts of colourful fields. A pretty perfect holiday. Headwater were very well organised and my reps, Brian and Olivia, were totally fantastic - helpful, very efficient and totally reliable. I was walking on my own and they texted me to ensure I had reached my destinations safely. The walks were wonderful and the instructions very clear. Everywhere I turned there was a picture postcard view. This is a wonderful area of Spain to visit - I did the Catalan Classic Walking holiday and walked every day, even though I didn't have to but there was so much I wanted to see. Wonderful that there was always hot water for a good soak in the bath when I got back to my hotel. I didn't want to come home although, to be honest I couldn't have kept up the walking for many more days. We enjoyed this holiday enormously although we spent quite a bit more than 5 hours on the walks between hotels so we didn't take the recommended walks on the days in between. The first walk is the hardest. Great fun. Our reps were extremely helpful. We will definitely do another walking holiday. The holiday was disappointing. Onward travel from Barcelona airport was so awful the thought of having to make the return journey hung over the rest of the period, such that I changed my flight and went home a day early, using bus rather than train. If you use Passeig de Graca station you need to supply the timetable - there is no way of identifying if you are catching the right train (and there's a train every 2 minutes) and it is an awful place to wait. Really enjoyable week with everything thought of and attention to detail. Excellent route notes. The representatives Katie and Jim made the holiday truly wonderful. They were extremely helpful with nothing too much trouble. This was our first Headwater walking holiday, and it has definitely lived up to our expectations. We thoroughly enjoyed the mixture of walks, as well as the cuisine and rest day activities. Jim and Katie are excellent reps, and definitely contributed to our memorable experience. Many thanks! I joined this vacation basically to walk through some lovely countryside and to see a lot of historic buildings in Spain. That was pretty much what I got. But in addition very enjoyable stays at the hotels where the staff all spoke great English and were really helpful. The guides made some very useful suggestions that saw me undertake day 2 hikes on day 1 and 2 . Good advice for the middle of summer and it enabled me to get back in time about 3.30 to enjoy the wonderful situation of Castell de Emporda. The Coastal phase was beautiful and after the completion of the hike and I stayed a few more days at Begur. A good mix of scenic, coastal, country and historic town locations for both walking and overnight stays. Introduced us to a lesser known area of Spain. While most of the walking had excellent scenery and moderate challenges, some sections were slightly tedious on tracks/roads rather than paths. However these were marked walking routes on the published maps, and it is difficult to see what alternatives were viable to get you to the next place of interest. No gain without pain! Walking instructions were excellent throughout. First time and we loved it. On our holiday we found the attention to detail and the help from the reps was outstanding. The detailed route notes in particular were very helpful and made the walking a pleasure. We will definitely travel with Headwater again. An interestingly varied holiday with wooded hills, inland country and scenic coastal walking, giving a good taste of the area. We particularly enjoyed walking via some of the beautiful mediaeval villages included in the route of the second walk. Also, we really appreciated having route notes for some suggested 'rest-day' walks, especially as this holiday is relatively short. The three hotels were also quite different and all had a charm of their own - we thoroughly enjoyed each one. This holiday would suit those looking for variety and a balance between activity and rest. The walks were well constructed, with some challenging sections, but not too exhausting, so there is a sense of achievement at the end of the day and tired legs are soon revived by a gentle swim and a good dinner! Thank you, Headwater, for a great holiday and we hope to be back for another one. Interesting and varied walking through delightful countryside with visits to and refreshment stops in beautifully preserved historic villages. Each day culminated in a stay in excellent accommodation, the highlight of which was the 3 nights we spent at Castell d`Emporda. See comments on rail travel, and specifically Headwater's absence of advice. Naturally people from the UK expect a similar experience to using the rail at home, and while this assumption would be valid for rail travel in France, Germany, NL etc, Spain was very different. Thank you for taking the time to complete your post-holiday questionnaire. We were pleased to see that you scored your holiday overall as good to excellent. However, it was disappointing to see that you encountered issues navigating the Spanish rail system. We would like to apologise for any inconvenience this may have caused. In order to improve the experience for future customers, we have been working closely with our local agents. With this in mind, we are pleased to advise you that for the 2015 season we will be pre purchasing all Spanish rail tickets. This should alleviate the time spent queuing and ensure a smoother trip through the Spanish region. Whilst we realise this does not help you personally. We do hope that it goes some way to show we take your feedback seriously. We really enjoyed this holiday. Moving from hotel to hotel provides much variety. There was a real problem getting drinks especially at the castle hotel. A welcome drink immediately on arrival at the hotel should be offered especially as people are very tired and thirsty after a long walk in the heat. Also the communication at the Castle Hotel needs to be improved, e.g. no one told us where to go for dinner when it was not outside as on the first evening. However, we really enjoyed the holiday in spite of these little things. Enjoyable. In the inland parts the villages were lovely with less interesting walking, but the coastal walking was great. Great walks. Plenty to see and do. Vegetarians beware. Dear Mr Gower, Thank you for completing your post-holiday questionnaire and for the feedback you have provided, we have discussed your comment regarding vegetarian meals with the hoteliers. As a result of this they have advised us they will ensure a better variety of vegetarian meals are available for future customers. We are sorry for any disappointment this may have caused you during your holiday and were pleased to see that despite this you had an enjoyable holiday. We really enjoyed our Headwater walking in the Catalan region. The walking was a great combination of inland and coastal routes. The mediaeval villages were lovely and at this time of the year not overcrowded. One or two of the walks had some challenging sections, particularly the suggested more interesting route to Begur on Day 4. We are older walkers and although experienced and fit we thought that the long relentless climb should come with a little more warning of the steepness. The weather was perfect for us but on very hot days this section of the route would be very demanding. Otherwise the descriptions of the walks and the routes themselves were helpfully detailed and informative. We enjoyed the holiday but did find some of the walks challenging. The accommodation was good but the quality of the food at the Hotel Rosa was outstanding. First try at a walking holiday and enjoyed it thoroughly. Would certainly recommend it. A wonderful mixture of healthy exercise,beautiful scenery, fantastic food and friendly people. The holiday overall exceeded our expectations. 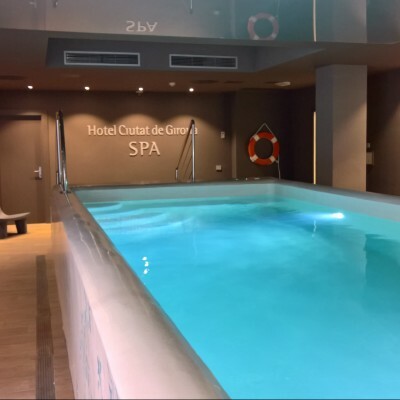 The Hotel Castell d'Emporda in particular is in a stunning location with exceptional service and quality. The food at the Hotel Rosa was excellent. The walking instructions were exemplary and Alan and Linda could not have been more helpful. I really enjoyed the holiday. The local rep was excellent as were his directions. He'd obviously put a lot of work into them. The walks were very enjoyable and varied. The Castle Emporda which was the highlight. The hotel in Begur was OK but the location in the town centre was great and the restaurant of higher quality. good experience well supported both by headoffice and at the resort. hotels were well chosen for quality of room and food. walking varied and interesting and routes accurate. let down by one hotel on one night which we will take up with the customer service team. The holiday was a chance to explore a region in depth and to do walks into deep countryside, which we could never have done without your detailed route notes. Lovely scenery, flowers, butterflies and birds. Some of the walks seemed quite long! - but worth the effort. Whilst we have had the most brilliant holiday as it was an old school reunion, considering the time in advance it was booked it seemed that the cost did not really reflect our expectation. We paid well over �1000 for a four night trip that did not seem very well tailored to our needs mostly in terms of transfer arrangements. We felt that for a group our size there could have been better transfer arrangements. The walking was very well organised and well marked and our guide whilst he clearly was not used to such a large group of opinionated women (!) he ensured that our needs were met. My sister and I were looking for a walking holiday which neither of us had done before. This was one of the best holidays I have ever had. The superb organisation from start to finish resulted in an almost totally stress free time. The walks were very thoughtfully planned , varied and a total delight. The scenery and views were spectacular. The area is unspoilt and full of history. The hotels and food were a real pleasure. The local knowledge meant that every aspect of the holiday was chosen carefully to maximise enjoyment. You just couldn't do this yourself. Grilled rep on way back about which holiday to do next. A very relaxing holiday in superb locations with varied walks & interesting local historical interest. Away from the usual tourist spots. Manageable walking for those not used to walking great distances & very helpful & knowledgeable local rep.
A fantastic holiday. Alans notes made the self guiding really easy. There was a lovely mix of different types of walks i.e. woodland, coastal, villages. Alan did his very best to plan the walks away from any main roads en route so we had a lovely, safe views and vistas. The Castella D'Emporada was one of the nicest hotels that we have stayed in, in the world. The food in both hotels was excellent. The bags arrived before us, as if by magic at each hotel. This is a beautiful area. This was a most beautiful part of Spain and completely unexpected. As we were the first guests of the season our hotels and destinations were not at all crowded. People had time to stop and chat. The weather for walking was perfect at this time of year. Although this was a 'soft' holiday, we found some of the walks quite challenging either in length (Castell d'Emporda to Begur) or difficulty (Cami de Ronda between Begur and Lafranc), but we took our time and shortened walks by taking the odd taxi (phone numbers thoughtfully provided by Alan). We have had many wonderful holidays over he years, both in Europe and elsewhere, but have never been so reluctant to leave an area. Every two days from 25th Apr 2019 to 28th Oct 2019, for 6 nights. All dates are subject to availability, please contact us to check. No departures between August 5 and August 23 inclusive. Due to the tailor-made nature of our holidays, we need a little more information in order for us to check availability for Catalan Classic Walk. Simply complete the form below and a member of our sales team will contact you (when it's most convenient for you) to provide availability information, travel options and an accurate price. Of course there's no obligation, but if you do wish to proceed with a booking they will be on-hand to assist you throughout the process.